Dorel Juvenile is one of the world's leading juvenile products companies. It owns a large portfolio of brands such as Maxi-Cosi, Quinny, and Safety 1st. In 20--, Dorel approached the Octo team with a new challenge: design an affordable, feature-rich stroller from primarily recycled materials, and make it right here in the USA. Dorel has production capabilities in the United States, Taiwan and China, but wanted to bring the manufacturing back to their Zero-Waste Facility in Columbus, Indiana and make the frame out of recycled plastic. For this mission, Octo had to balance consumer needs with strong cost constraints and technical specificities of recycled plastics - because this material is not stiff as when it’s new, making something as structural as a stroller frame was a real challenge. Bring it on! A classic stroller is a complex amalgam of more than 50 pieces of metal, plastic and other materials, all riveted together. The high cost of labor in the United States meant that reducing assembly time was necessary to make local production possible. Prototypes of various materials aided greatly in the design process. From rough sketches for size and scale, to mechanical prototypes for styling and function, to full-scale prints of the CAD design, each model brought us closer to balancing form and function : from very rough ones made of wood - to get a general idea of size and scale, and a sense of how they feel like when pushed around - to plastic ones - to start reflecting on the shape and the functionalities. One of the biggest challenges was to balance the look and feel for the stroller and the best mechanical use of the material. The juvenile products category has a large number of consumer safety standards. Early on, testing was a large part of the design process in order to ensure the stroller would have no surprises down the line. The majority of classic strollers are easy to disassemble and modify if some parts don’t pass testing. However, because the RIVA stroller was designed to have just a few large molded components, a failed standard would mean we would have had no other choice but to start from scratch. 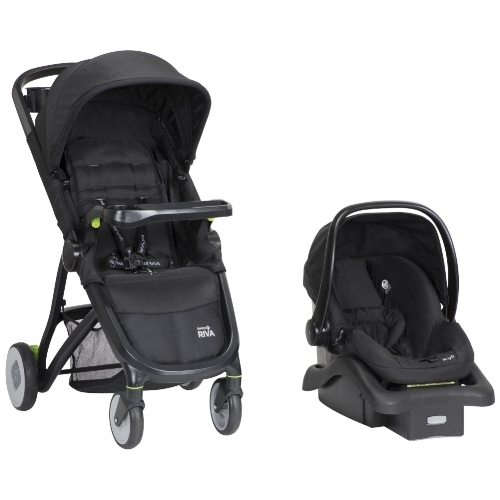 During this 8-month long project, Octo collaborated with Dorel from the first strategic planning meeting to the initial safety standards test : the stroller, distributed through major retail chains like Walmart, was a commercial success.